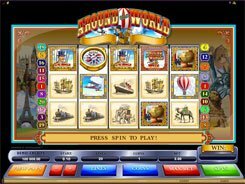 Inspired by a classic adventure book by Jules Verne, Microgaming has developed an incredibly enticing five-reel slot called Around the World. The symbols set represents an array of hand-drawn images of some means of transport that were typical of the late 19th century, including a camel, a balloon, a steamboat, a sailing ship, etc. The slot has an impressive betting range of between $0.01 and $200, with a coin denomination tuned from 1 to 10 per line. The red biplane is the most valuable regular symbol that yields up to x300 a line bet, for 3 to 5 of a kind. To add a bit of thrill to the gaming action, the slot is equipped with two wild symbols. One of the wilds depicting a top-hatted man awards a whopping 10,000-coin win, for five of a kind. Three to five Compass icons scattered anywhere pay out up to x800 times your original wager. The most exciting feature that makes the slot stand out from the crowd is the Globe bonus game triggered by 3 to 5 Globes. On the second screen, you will see the world map and have to choose one of the four routes to travel around the world. If you avoid all shipwrecks on your way, a great reward is waiting for you when back in London.